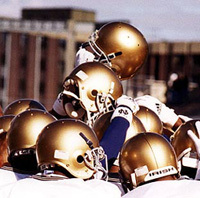 In the fall of 2003, ESPN created a special prime time weekly program about the University of Notre Dame called 'The Season', featuring scenes of campus life on and off the field. The O'Neill Brothers' music was frequently used during these picturesque segments every week. Since both Tim and Ryan O'Neill are graduates of Notre Dame ('94 and '97) the University has always had a special place in their heart. They began performing concerts on two grand pianos for the yearly Keenan Revue, a campus wide talent show, and shows of their own. The O'Neill Brothers have recorded three CDs of Irish music, two of which were recorded specifically for the University of Notre Dame. Click here to see these CDs.